It’s hard to forget that night in the 1980s when Red Auerbach came down from his seat in the stands, rushed onto the floor where his Celtics and the 76ers were just starting a tussle – during a pre-season game no less – and jumped right into the mix. Pushing 70 at the time, Auerbach stepped up to Moses Malone, stuck a bony finger into his chest and challenged him to a fight. Don’t mess with the Celtics. Often superlatives are dished out where they don’t belong. They are hyperbolic, trite and cliché. The media, it seems, always wants to anoint someone or something as the greatest this or that. My theory behind this is that people want to be close to greatness and want to be able to tell others that they were there for something extraordinary. That’s human nature, I suppose. But in regards to Red Auerbach, who died Saturday night just shy of his 89th birthday, Stern nailed it. Stern, as well as anyone, knows that the NBA would have likely failed in the late 1940s or early 1950s had it not been for Auerbach. Better yet, it was Auerbach’s innovation and foresight that spurred the league’s emergence from one of regionalized interest like the current NHL, to a global force. Simply, Red Auerbach was a genius. Fortunately, I was able to have a brush with greatness on several occasions. Auerbach and I became pen pals of sorts during my college days. A few times a year I wrote Auerbach letters asking for his opinions and advice on certain subjects mostly related to basketball. I never expected a reply and certainly never handwritten notes on his personal stationary, but every letter received a response and always with an unforgettable pearl of wisdom. He didn’t write bleep, but the point was one that I heard him espouse in interviews and books – if a guy can play, he can play. It doesn’t matter how long he’s been doing it. Again there’s the genius of Red. Certainly his experience resulted in him picking out something in Bill Russell and Larry Bird that no one else saw. The same thing goes for Bob Cousy, Robert Parish and Kevin McHale. 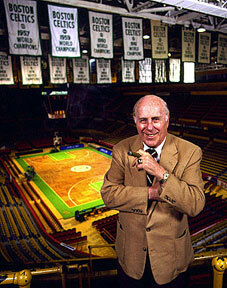 Red Auerbach was once in a lifetime. Sadly, that long lifetime came to an end.